This “artificial satellite” aroused the interest of the media since the late 50’s, and it became one of the most discussed subjects in the space. Considered the first Russian spy satellite, satellite Black Knight captured the interest of millions worldwide. 1. According to regulatory bodies around the world, the “Black Knight” satellite was transmitting radio signals for over 50 years, at least. 2. Both the USA and the USSR (Soviet Union) have shown a great deal of interest in this “unidentified flying space object” that circles the planet to this day. 3. Rumor has it that it was Nikola Tesla was the first person to “intercept” the satellite signal from the “Black Knight” in 1899, after he constructed a high-voltage radio in Colorado Springs. 4. Astronomers Since 1930 worldwide report strange radio signals that seem to come from the “Black Knight”. 5. Dr. Luis Corralos (of the Communications Ministry in Venezuela) photographed, in 1957, the Black Knight while taking pictures of Sputnik II, as he passed through Caracas. 6. History of Black Knight Media debuted in the 1940s, when the St. Louis Dispatch and the San Francisco Examiner wrote “Satellite” on May 14, 1954. 7. Time Magazine wrote about the Black Knight Satellite on the seventh in March 1960. 8. In 1957, an unknown “object” was spotted “shadowing” Sputnik 1 spacecraft. According to reports, “unidentified flying object” was in an unusual polar orbit. 9. In 1957, neither United States or Russia owned technology to maintain a spacecraft in polar orbit. 10. The first polar orbit satellite was launched in 1960. 11. Even today, polar orbits are only used for land mapping, earth observations and reconnaissance satellites. This would put the Black Knight in the category with the observation satellite. 12. During the 1960 Black Knight Satellite was located once again in a polar orbit. Astronomers and scientists estimate the weight of objects to be more than 10 tonnes, which would be heavy when compared to other artificial satellite that orbit the planet. 13. The unusual orbit Black Knight was unlike any other object in the sky. 14. Grumman Aircraft Corporation gave great importance to this mysterious “Satellite”. On Sept 3rd, 1960 (7 months after the mysteries object was first detected by Tesla) a tracking camera at the Long Island plant photographed the Black Knight Satellite. 15. Grumman Aircraft Corporation formed a committee to study the data obtained from observations made in 1960, but nothing of their finds (if anything were indeed ever found) were ever made public. 16. Gordon Cooper, in 1963, was launched into space. On his final orbit, he reported seeing a glowing green object before the capsule and observed it moving at some distance in the direction of their spacecraft. Tracking station Muchea, Australia, caught Cooper’s object on radar as traveled from east to west. 17. It was an amateur radio that apparently decoded a series of signals received from the UFO satellite and interpreted it on a star chart as coming from star system, Epsilon Bootes. 18. 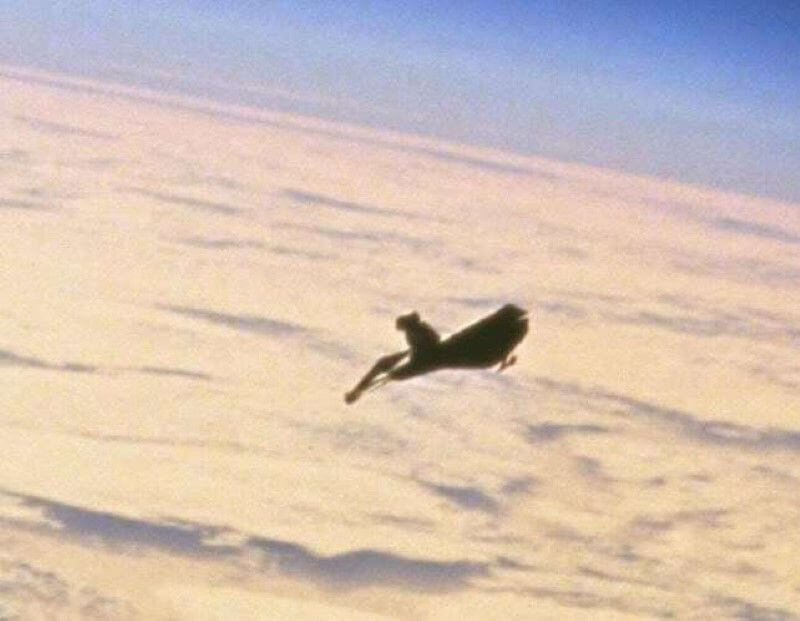 According to the decoded message being received on Earth, the Black Knight Satellite seemed to originate from the Epsilon Bootes Star System 13,000 some years ago. 19. August 23rd, 1954 Technical Journal Week aerospace engineering released a story about the Black Knight Satellite, which angered the Pentagon who were trying to keep the information secret.